1.Gloss & Clarity:Benkai wrap;s excellent gloss and clarity increases the cleanness of the product. 2.Freshness:Benkai wrap;s high transmission rate of O2 and CO2 and excellent moisture retention keep the food stay fresh. 3.Anti-fog:Benkai wrap can break up the water drops automatically to maintain its good clarity as well as the food;s freshness. 4.Cold Resistance:Benkai wrap;s excellent cold resistance remains the softness even under freezing. 5.Wrapping Applicability:Due to its adequate softness, stickiness and elongation, Benkai wrap can be well stretched over the food tightly without the trouble of sticking up and bad wrapping. PVC Cling Film is widely used for the food wrapping and preservation purpose, we supply large specifications which are used by food industries, supermarkets, catering companies, hotels and families. 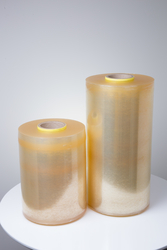 Benkai is a leading supplier of PVC Cling Film in Taiwan. We can do the customized specifications which cover from the Industrial level to the Household products. By years of experience cooperating with importers, catering companies, supermarkets and distributors over the world, Benkai is not only a supplier, but also a reliable partner of customers.